In December 2017, we send you a free hand cream from Terai Cosmética. Use the voucher* 122017 before your order confirmation and we will include it in your parcel. Hand cream "Unión entre cosmos"
The high levels of oat ( rich in protids, lipids, vitamins and mineral salts) and Calophyllum oil, smooth and calm dry skin. The organic oils : rich in omega 3 and in antioxydants, and well balanced in omega 3 6 and 9. Apply a small quantity and massage gently using circular movements . Open to the benefits of Bach Flowers. Ingredients: Aqua (Water), Cannabis sativa (Hemp) Seed Oil*, Cocos nucifera (Cocunut) Oil*, Blend of Glyceryl stearate (and) Cetearyl alcohol (and) Stearic acid (and) Sodium lauroyl glutamate (emulsionante de origen vegetal), Avena Sativa Kernel Flour *, Calophylum inophylum (Tamanu) Seed Oil*, Xanthan gum (espesante de grado alimentario), Potassium sorbate (conservante aprobado por Ecocert), Sodium benzoate (conservante aprobado por Ecocert), Helianthus annus (Sunflower) Seed Oil* & Rosmarinus officinalis Extract* (antioxidante), Alcohol denat. * (flores de Bach), Citric acid (ajustador de pH). * Ingredients from organic origin. 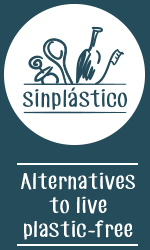 * This voucher is reserved to persons how ha subscribed to Sinplástico's Newsletter . Available once per person untill 31/12/2017.